1. Remove outer white skin of the jackfruit seed and soak it in water for 4 to 6 hours. 2. Remove the brown skin of the jackfruit seed. 3. 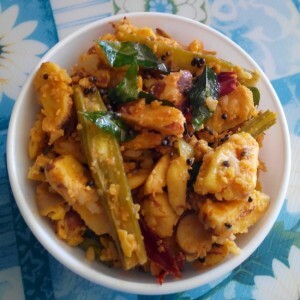 Grind coconut, Jeera, shallots, green chillies coarsely. Keep aside. 4. Cut the jackfruit seeds lengthwise. 5. Cut drumstick to 2” length pieces. 6. Cook the jackfruit seed in salted and turmeric water. 7. When the seeds are half cooked add drumsticks. Cook till tender. 8. Heat oil. Add mustard. When mustard starts to splutter add remaining tempering ingredients. 9. Add the cooked jackfruit seed and drumstick to this and mix well. 10. Add the coarsely ground coconut, jeera, shallot and green chilly mixture. 11. Cover and cook till done.